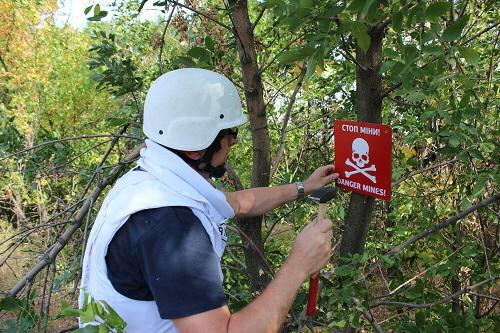 In the ATO zone, shellings by Russian-terrorist forces were observed. Over the past 24 hours, the positions of the Ukrainian Armed Forces between Katerynivka and Popasna were shelled by a sniper group that worked under cover of heavy machine guns; erratic militant fire from small arms was recorded north of Strohnativka, between Mar’inka and Krasnohovorivka, as well as near Shumy, Avdiivka, and Zaitseve. Information about Putin’s plans to “cut the DNR and the LNR loose” continues circulating among the soldiers of the Russian Armed Forces. Career officers of the Russian Army are not as inclined to take “vacations” on Ukrainian territory and participate in terrorist activities of illegal armed groups in Donbas. Terrorists also actively discuss the information about “[Putin’s] adieu.” Militants are increasingly discussing the idea of being prepared “to stop the war” on the condition of a guaranteed amnesty from Kyiv. Terrorists are assembling a “special forces company of the DNR” in a city of Novoazovsk; [the company will be staffed with] up to 50 people, who will function as interior troops. The unit will conduct sweeps in the district, monitor checkpoints, etc. Deployment of a gang was detected in the area of Starobesheve (along the Kuteinykove–Starobesheve–Mospyne line). The gang includes up to 20 different AFVs and 8 tanks. Its personnel was transferred to this area from Donetsk on board of army trucks and civilian passenger vehicles. In the area of ​​Novofedorivka, an artillery battalion of Russian-terrorist forces was deployed on previously equipped positions. The battalion includes one battery of MLRS BM-21 “Grad” and one battery of 2S1 “Akatsiya” self-propelled artillery guns. Active delivery of ammunition to the positions of terrorist mortar units (82 mm mortars) was observed in the Petrovskyi and Kyivskyi districts of Donetsk. Nine covered boxcars with ammunition and equipment, and three platforms with two T-72 tanks on each arrived at the Ilovaisk train station. The IR network identified a base of special forces of the Russian GRU of the General Staff in the vicinity of Lutuhyne. The “head” of the “DNR” terrorist organization Aleksandr Zakharchenko is actively preparing for the so-called elections. Following his order, printed media entitled Evening Donetsk is currently in the works. The [newspaper] will cover information “about the state of the economy and industry of the DNR,” and most importantly, [it] will become the information mouthpiece of Zakharchenko’s PR campaign for fictitious elections. The appointed editor of the newspaper is Tatyana Dubova, a photojournalist of the Donetsk bureau of a Russian news agency RIA “News” and former chief editor of the Donetsk “Vesti” [newspaper]. The newspaper will launch on September 30. The Presidential Administration of Russia ordered the Ministry of Defense, the FSB, the Investigative Committee, and the Foreign Ministry to urgently prepare materials [in order] to discredit the Ukrainian leadership during Putin’s speech at the UN General Assembly. The Russian President will try to accuse the Ukrainian authorities of crimes against humanity on the territory of Donetsk and Luhansk regions using “pictorial materials” akin to a “crucified Slavic boy” [circulated on Russian TV in July of 2014].